You are at Home Eatery Critique The Steakhouse Grill-Off is Heating Up! Blackstone Steakhouse and Grill reaches for the Gold. When you think of “steakhouse”, you probably think of the steakhouse heavy hitters. The Keg. Chop. Morton’s. And they are hitters in their own right. So imagine how excited I was when I heard about Blackstone Steakhouse and Grill, a local steakhouse specializing in Halal steaks. And just like an old-school arcade cabinet would say when a 2nd player threw some coins into the machine- Here Comes a New Challenger! Because Blackstone is bringing the fight. And dare I say… Blackstone might even be better all the steakhouses that I mentioned. Bold statement. Yes, I know. Read on. It must not contain alcohol. Zeb tapped into his worldwide restaurant expertise and wanted to break new ground by offering something completely different from the established steakhouses. So, at Blackstone Steakhouse and Grill, everything is made from scratch. And you can taste it. When I joined them for dinner, you can also tell that guest satisfaction is a huge priority. The restaurant’s phones were ringing off the hook the entire time I was there with hopeful patrons wanting to book reservations. But Zeb only took reservations for the number of guests that the restaurant could comfortably handle. This was done so he wouldn’t be forced compromise the quality of food coming out of his kitchen. Take it from me, a decade-long veteran of the industry- you don’t see this in the restaurant industry. This is a refreshing approach to running a restaurant. I can get behind this. Just writing this blog post is making me hungry so let’s move onto the real star of the show- the food! Chef Zeb’s homemade focaccia bread. Cloud-like softness and tasty. 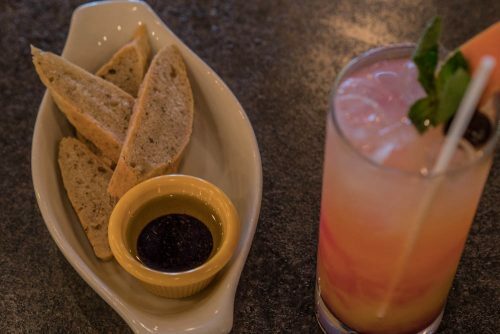 The warm bread dipped into olive oil and balsamic… it doesn’t get any better than this! 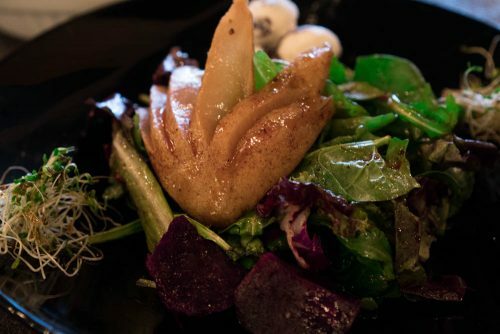 Next, I indulged in this poached pear salad with cranberry goat cheese. It was simply divine. … it deserves a second photo! Remember when you were a kid and went to restaurant and thought you were so special getting a Shirley temple since it looked so much like an adult drink? This nostalgic feeling never ends! 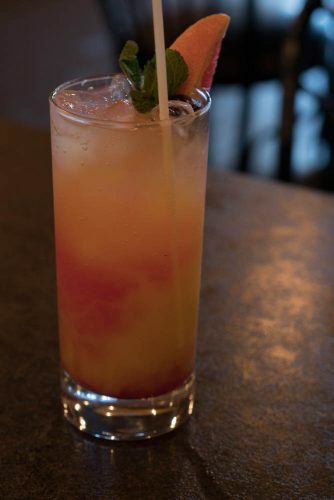 This beautifully-crafted Shirley temple has no alcohol. After all, this is a Halal restaurant. They do have non-alcoholic wines for those who want to dream of Bordeaux. Everyone who dines here raves about their steaks and how it is the best they have ever had. So I had to put it to the test… and you know what? The people have spoken. The steak is incredible. Cooked to perfection. Came out on an amazing blackstone (now you learn where the name comes in!) that was sizzling hot. As you sliced into it, it was tender and juicy and just everything you want in a good steak. 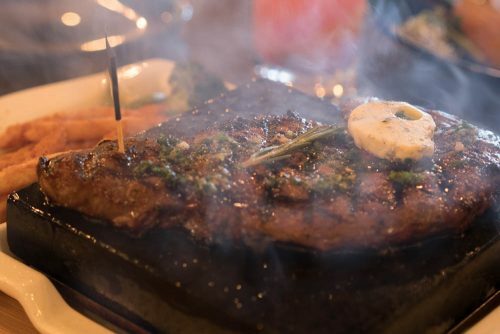 There was an endless amount of flavours once the steak touched my tongue, and the steak just simply melted in your mouth. Bite after bite, it was like you were high on delicious steak. I didn’t want this experience to be over! Blackstone Steakhouse and Grill have fantastic owners that truly understand how to run a restaurant. 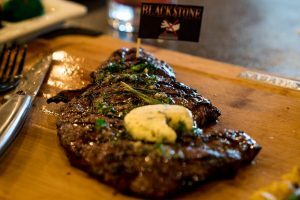 The combination of delicious food that is reasonably priced paired with owners that are passionate about the business and customer- this is a success story waiting to happen.Blackstone Steakhouse and Grill is definitely my new favourite steakhouse. If you love steaks like I do, don’t wait up. Call and book a table today! !